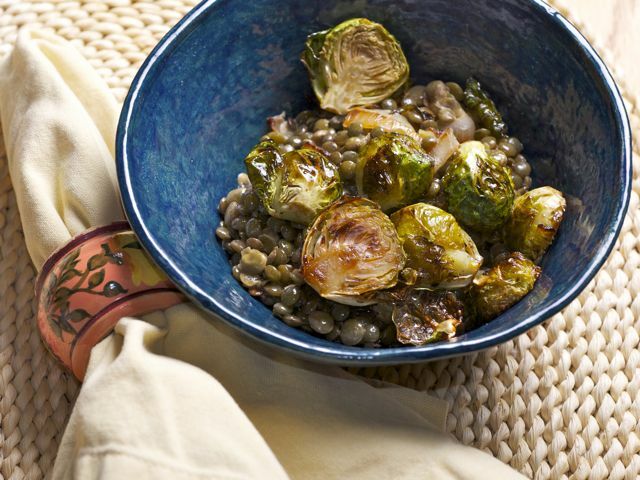 In this stew, lentils take center stage together with Brussels sprouts. Roasting the little cabbages at high heat makes them turn sweet and crispy, especially the blistery-brown outer leaves. Cut the ends off the Brussels sprouts and cut the remaining sprouts in half. Place them in a baking dish large enough to hold them in one layer and toss them with the olive oil, salt, and pepper. Roast them in the bottom third of the oven until browned, 18 to 20 minutes. Drizzle the honey and balsamic vinegar over the Brussels sprouts. Stir to coat them all over with the honey mixture, and roast until the Brussels sprouts are well browned and slightly sticky, 5 to 7 minutes. Set a large, heavy skillet over medium heat. Add the oil and butter. When the butter has melted, add the onion and a generous pinch of salt. Cook, stirring occasionally, until the onion is tender, about 10 minutes. Turn down the heat to medium-low and continue cooking the onion until golden brown, 5 to 10 minutes. Drain the cooked lentils, reserving the cooking liquid. Add the lentils and ⅔ cup cooking liquid to the onions. Bring to a simmer. Add the cream and mustard. Cook just until the liquid returns to a simmer. Divide between 4 bowls and top with the Brussels sprouts.